Description: An annual herb, it lies along the ground and has slender stems. There is a single line of white hairs which run up the stems until they reach a joint. The stems are round in cross section. The leaves occur opposite and the lower leaves have stalks, are oval and taper to a short point, 1-3 cm long and 5-10 mm wide. Leaves are pale underneath. The flowers are white in a flat topped arrangement with central flowers opening first. The fruit is an oval capsule with red-brown seeds inside. There are several closely related plants referred to as chickweed, but which lack the culinary properties of plants in the genus Stellaria. Plants in the genus Cerastium are very similar in appearance to Stellaria and are in the same family (Carophyllaceae). Stellaria media can be easily distinguished from all other members of this family by examining the stems as it has fine hairs on only one side of the stem in a single band. Other members of the family Carophyllaceae which resemble Stellaria have hairs uniformly covering the entire stem. Edible Uses: Young leaves – raw or cooked as a potherb. They can be available all year round if the winter is not too severe. Very nutritious, they can be added to salads whilst the cooked leaves can scarcely be distinguished from spring spinach. The leaves contain saponins so some caution is advised, see the note on toxicity. Seed – ground into a powder and used in making bread or to thicken soups. It would be very fiddly to harvest any quantity of this seed since it is produced in small quantities throughout most of the year and is very small. The seed contains 17.8% protein and 5.9% fat. Warnings: The leaves contain saponins. Although toxic, these substances are very poorly absorbed by the body and so tend to pass through without causing harm. They are also broken down by thorough cooking. Saponins are found in many plants, including several that are often used for food, such as certain beans. It is advisable not to eat large quantities of food that contain saponins. Should not be used during pregnancy or during breastfeeding. Medicinal Uses: Antirheumatic; Astringent; Carminative; Demulcent; Depurative; Diuretic; Emmenagogue; Expectorant; Galactogogue; Kidney; Laxative; Ophthalmic; Poultice; Refrigerant; TB; Vulnerary. 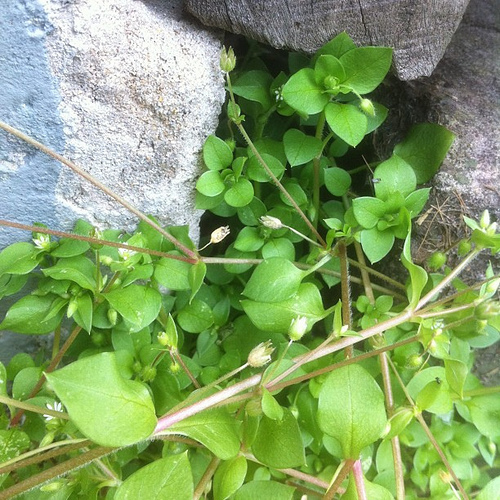 Medicinal Information: Chickweed has a very long history of herbal use, being particularly beneficial in the external treatment of any kind of itching skin condition. It has been known to soothe severe itchiness even where all other remedies have failed. 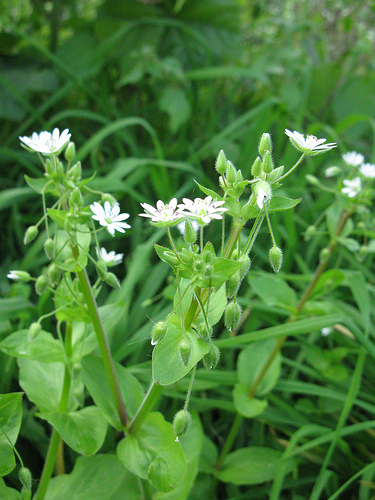 In excess doses chickweed can cause diarrhoea and vomiting and it should not be used medicinally by pregnant women. The whole plant is astringent, carminative, demulcent, diuretic, expectorant, laxative, refrigerant, vulnerary. Taken internally it is useful in the treatment of chest complaints and in small quantities it also aids digestion. It can be applied as a poultice and will relieve any kind of roseola and is effective wherever there are fragile superficial veins. An infusion of the fresh or dried herb can be added to the bath water and its emollient property will help to reduce inflammation – in rheumatic joints for example – and encourage tissue repair. A decoction of the whole plant is taken internally as a post-partum depurative, emmenagogue, galactogogue and circulatory tonic. It is also believed to relieve constipation and be beneficial in the treatment of kidney complaints. The decoction is also used externally to treat rheumatic pains, wounds and ulcers. The expressed juice of the plant has been used as an eyewash.